Up to 100 people are feared dead after an earthquake of magnitude 6.5 rattled south-west China late on Tuesday. Seven people died and 88 were injured in the quake, including 21 seriously, the official Xinhua news agency said. It said all the dead were visitors to the area. President Xi Jinping called for “all-out efforts to rapidly organise relief work and rescue the injured people”, according to Xinhua. The quake occurred about 9.20pm (13.20 GMT), not far from the site of a massive magnitude 8.0 earthquake that struck in 2008 leaving 87,000 people dead or missing. 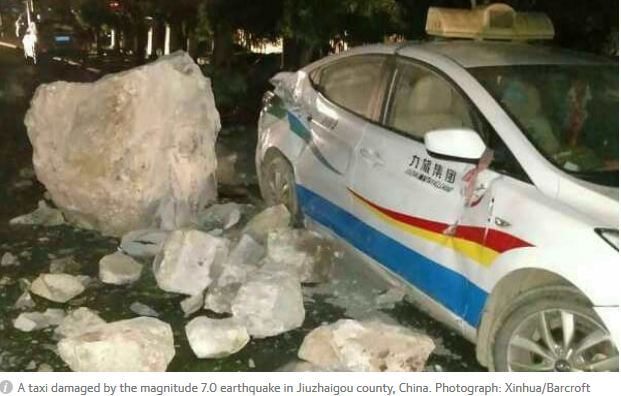 Its epicentre was 284 kilometres (176 miles) north of the provincial capital Chengdu and struck at a depth of 10 kilometres, the US Geological Survey said. The affected region, Jiuzhaigou county, includes one of the country’s most famous national parks, a Unesco World Heritage Site known for karst formations and lakes. More than 38,000 people visited the tourist site on Tuesday, according to the official Xinhua news agency, which added that electricity was cut off briefly but was restored. Photos from the area posted on social media showed masses of people milling about on streets scattered with light debris, and a taxi dented from being hit by a large boulder. Over 600 fire officers and soldiers have been deployed, the People’s Daily newspaper said. China is regularly hit by earthquakes, especially in its mountainous western and south-western regions.